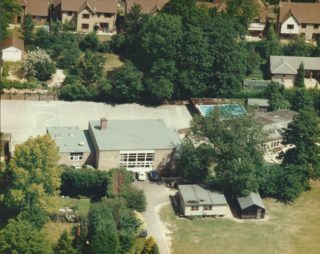 It all started with a notice to all parents from the Headmaster, Mr Shoote, on 6th November 1964 stating that the County Education Committee had offered to include Harston in the list of schools for which a grant would be made towards the cost of a swimming pool, on the understanding that the school would also raise money towards the cost of the pool. The County Physical Education Officer showed a pool of the type suitable for Harston School to a meeting of parents on 17th November and the idea was given unanimous support. A committee was formed to raise money and a Christmas Draw was quickly organised and proved a great success. Constant support to the fund was also given by the parents in the form of weekly contributions and other activities were organised to swell the rapidly increasing total. These included a wonderful concert which filled the Village Hall to capacity and included excerpts by the children from “The Magic Flute”. By the end of the Spring term 1965, it was clear that the fund had grown enough to ensure that the pool could be installed in the Summer term, and it was duly delivered, put together, ready and in full working order, complete with filtration plant, cover, steps and guide ropes, for opening on 19th June. This official opening, on a glorious day, was performed by the Chairman of the County Education Committee and the Chief Education Officer also came. Entertainment was provided by a fancy dress competition and a judo demonstration. For the record, the pool is 33 feet x 17 feet x 3 feet deep and holds 8000 gallons of water Twenty-two children can use it at a time and it is ideal for teaching little ones while large enough for the practised swimmer to enjoy. In fact, thirty-four children, all non-swimmers, gained their Preliminary Certificate for swimming one length by the end of the Summer term. From inception to opening took only seven months and to raise the not inconsiderable sum of money required in that short time could not have been done without the support and generous donations of time and money which were given by so many people and organisations, to whom grateful thanks is due.